Is Tesla Autopilot responsible for another driving incident? Another driver is blaming an accident on Tesla's Auto Pilot. A driver using Auto Pilot was traveling through Montana in the wee hours of the morning when disaster struck. 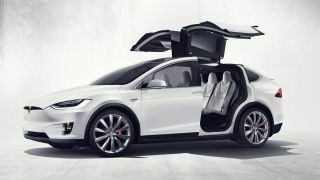 A post on the Tesla Motors Club forums by the driver's friend, claims a Tesla Model X using Auto Pilot was traveling along Highway 55 in Montana, near a sharp drop off, when the vehicle failed to stay on the road and plowed into a string of wooden bollards. According to Montana State Trooper Jade Schope, the accident occurred on Sunday morning around 2 a.m., after the driver got off I-90 near Whitehall. The Model X, which was traveling between 56 and 60 mph, veered toward the right and collided with a string of wooden guard rails. While the two occupants are fine, the Model X will likely not survive. The accident took out the passenger side front bumper, tore the tire off and pieces were strewn on the highways and shoulder. This is the third highly-publicized accidents utilizing Tesla's Auto Pilot system in the last several months. The first case involved a 40-year-old male whose Model S failed to detect a semi-truck trailer, resulting in a fatality. The second was a roll-over accident after a Model X crashed into a guardrail; those occupants were uninjured. Currently, the NHTSA is investigating the Tesla Auto Pilot crashes and has not commented on any of the crashes involving Auto Pilot. The Securities and Exchange Commission is also investigating Tesla for potential disclosure violations for not informing authorities of the fatal accident sooner. Auto Pilot is Tesla's semi-autonomous driving software which is currently in life beta-testing on roads across the globe. More than 7 million miles have been driven using Tesla's Auto Pilot system, however, it is not fully-autonomous and still requires the drivers to remain attentive and in control of the vehicle. While the Auto Pilot system isn't foolproof, it is invariably better than the millions of bad drivers on the roads and cuts accident rates by 50%.